Though the days of using design tools such as the Leroy Lettering Set and polyester film are long gone at the Chester County Planning Commission, Graphics Supervisor Diana Zak has advanced with design technology at the agency over the years. Diana celebrated her 25-year anniversary with the county in September. She landed a job with the Planning Commission while looking for the stability that comes with a full-time job. She previously did freelance work for environmental, planning, and nuclear engineering firms. When she was a freelancer, she had limited opportunities to get feedback from design colleagues. When Diana started at the Planning Commission in 1992, she was a graphics specialist and eventually was promoted to graphics supervisor. “I’ve definitely been able to use my design talents in this job,” said Diana, who has a Bachelor of Fine Arts degree from the Tyler School of Art in Philadelphia. The duties of the graphics section have changed through the years. When she started here, all visual related initiatives were submitted to the Graphics section. However, after planners could make maps with a geographic information system (GIS) on computers, the Graphics staff focused more on document design and marketing. “That’s when there was an awesome shift because—as supervisor—I got to work with Graphics staff on numerous creative processes,” she said. “And now we’re onto another new exciting direction.” The Graphics section works with the office’s map makers, planners, and landscape architects to create illustrated planning concepts that are more easily understood by the public. She especially likes projects that involve problem-solving and learning something new. 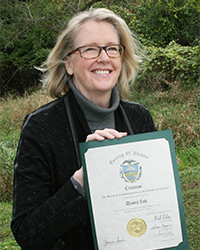 In the past, Diana worked on Landscapes, the county’s original, award-winning comprehensive plan; Landscapes2; and the related marketing materials. She also illustrated numerous planning concepts and environmental topics, and designed various documents, posters, and brochures. The Chester County Commissioners honored Diana, Graphics Specialist Polly Chalfant, and employees from other departments who have worked for the county for 25 years during a meeting last month. Diana is also very appreciative of all her colleagues at the Planning Commission and feels lucky to work with such smart and special people. “It feels good to be part of the Planning Commission’s role in the county over the years,” she said. When she’s not at work, she enjoys sketching, painting, hiking, sailing, skiing, experimenting with new recipes, and traveling. She recently returned from visiting family in the Czech Republic and was impressed by the vistas of countryside as depicted in 19th century paintings.